As the ultimate event of the AIT International Grand Prix, the Blue Riband AIT Mile event never ceases to lift the crowd. It is possible that there has never been a more popular third-place finisher at an indoor meet in Ireland. While Ryan Gregson comfortably won the race in 3.57.86, it was former AIT scholarship student, John Travers, who made Irish athletics history by becoming the first Irish man to run a sub four-minute mile on home soil (3.59.40 ). The gracious Australian winner, Gregson, allowed Travers to take the limelight and applause of the crowd post-race. Grzeforz Kalinowski of Poland was the other man to run sub four minutes when he clocked 3.59.19. 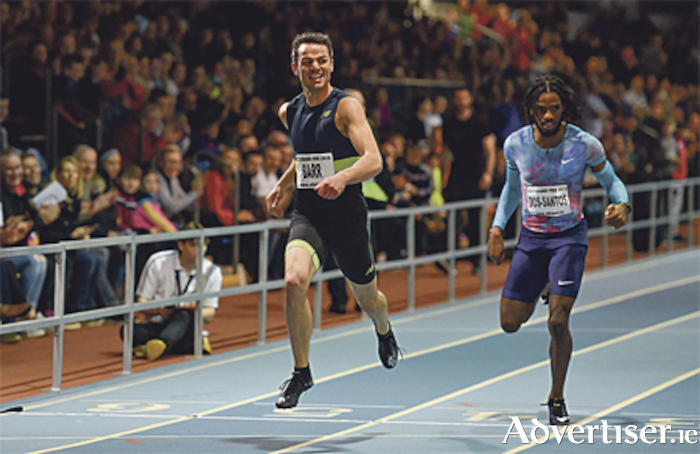 Irish headliner Thomas Barr thrilled the home crowd with a come from behind victory in the final 40m of a brilliant Ericsson 400m men’s race. Barr was the only athlete to dip under the 47-second barrier, which was an amazing time for a 400m hurdles specialist. Barr was fulsome in his praise of the ecstatic sell-out crowd, who he credited with helping him overtake Ricardo Dos-Santos of Portugal in the home straight. The Bank of Ireland men’s pole vault proved to be a scintillating event. Current world champion Sam Kendricks and former world champion Shawn Barber had a big battle, which was ultimately won by Kendricks. The winning vault was a massive 5.70m. A packed Alkermes 800m men’s field treated the large crowds at the AIT International Arena to a brilliant spectacle. Spaniard Kevin Lopez had to dig very deep into his reserves to hold off Irish hero Mark English. The fact that Poland’s Mateusz Borkowski and Great Britain’s Andrew Osagie could only manage third and fourth respectively tells us what a fine run English gave. A late addition to the field, Danaid Prinsen from the Netherlands pushed Latvia’s Liga Velvere into second place for the second year in a row in the Westmeath County Council women’s 800m. Prinsen (2.02.29 ) carried her form from last weekend where she became the Dutch national champion all the way to Athlone. Jamaican Ryan Shields (6.63 ) was just five hundredths of a second off the stadium record to win the Hodson Bay and Sheraton Athlone Hotels men’s 60m from previous winner D’angleo Cherry of the USA. Dutch athlete Joris Van Gool rounded off the podium. Another Dutch athlete was the winner in the DPDs women’s 60m. Naomi Sedney, who was fourth favourite before the race, won in a time of 7.30 while pushing American Harrigan-Scott and Jamaican Calvert-Powell into the minor places. Joan Healy and Niamh Whelan put in strong performances in an excellent final. Lindsay Lindley was the winner of a very competitive Athletics Ireland women’s 60m in a rapid 8.04, with pre-race favourite Raven Clay only managing third place in 8.22. Dutch girl Eefje Boons was second with a time of 8.01. Ireland’s Sarah Lavin finished in fourth with a time of 8.35. Sofia Ennaoui put in a blistering final 300m to win the Roscommon County Council women’s 1,500m in 4.10.63. German girl Gesa Krause, a perennial favourite at the AIT GP, just took second place from Australian Zoe Buckman. The AIT Sports men’s high jump almost had an Irish winner in Barry Pender, who finished third on countback. Event favourite Jaroslav Bába won with 2.19m, followed by Norbert Kobielski and Pender, who both jumped the same height as Bába. The Midlands Print women’s long jump was won by Ireland’s Sarah McCarthy with a winning jump of 5.62m. McCarthy was consistent throughout the night, with five of her six jumps coming in at 5.53m+. AIT’s own Amy McTeggart took second place with two 5.51m jumps.